This season on Open Homes Australia, Adam Swanson is cooking up some wonderful recipes with La Casa Del Formaggio Cheeses. 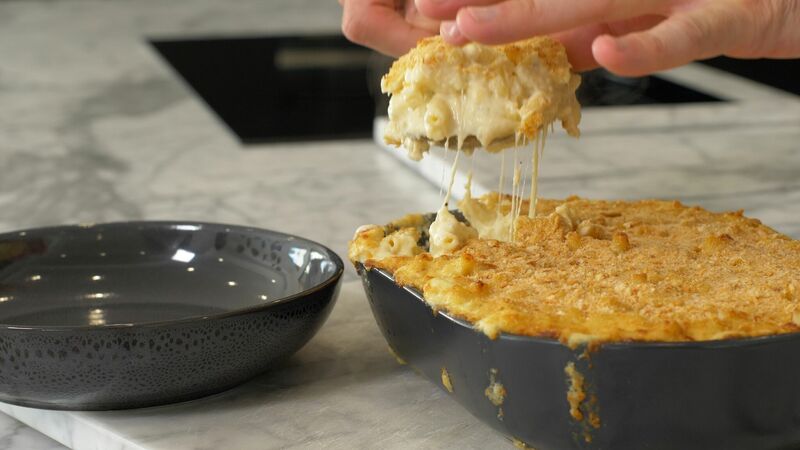 This is his ultimate Mac and Cheese recipe using four cheeses and cauliflower for texture. 2 Cook pasta as per packet directions. 3 Take cauliflower and cut into small pieces, cutting off majority of stem. Place cauliflower and butter into a small saucepan. Pour cream over and enough milk to cover cauliflower. On a low heat, bring to the boil. Stir occasionally, and cook until cauliflower is soft and tender. 4 Place cauliflower and cream into a blender and blend until smooth and thick. Alternatively, you can use a stick blender if available. 6 Pour cauliflower cream into a pan on low heat. Add gorgonzola, fontina, bocconcini (squished), parmesan and combine with cauliflower. Agitate the pan so the sauce reduces slowly and doesn’t burn. 7 Add pepper and cooked pasta to sauce and mix together. Pour this mixture evenly into a baking dish. Scatter breadcrumbs across the top. 8 Bake in the oven for 15 minutes or until golden brown.